Our mini love heart cakes are ideal for a variety of celebrations from Valentines Day to birthdays and anniversaries, or just as a special treat to let the loved one in your life know you're thinking of them. 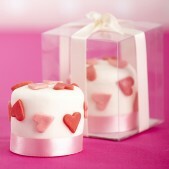 These love heart cakes are also perfect as wedding favours and can be individually boxed as gifts for wedding guests. 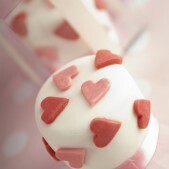 Trade the roses in for a more contemporary way to show your love and gift your special person some gorgeous mini love heart cakes! 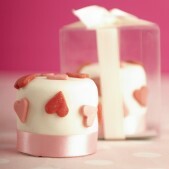 Our perfectly designed mini love heart cakes have been created with real attention to detail. These mini fruit cakes are a unique way to declare your love and an ideal way to show someone you have been thinking of them. 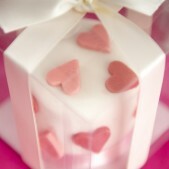 Mini Cakes start from £9.95 per cake with a minimum order of 12 cakes. We can deliver free of charge in and around London.